Wild Scarlet reflects her 💕passionate 💕beauty and romantic elegance into your home as only one perfect red rose can. Wild Scarlet is a faux timepiece, but she will not disappoint. Find the perfect spot for her beauty & mod size. She’ll step up your cool quotient. She obviously complements most settings. I put mine off the kitchen in an area thats a lil rustic but has given way to all the plants that I love to collect. 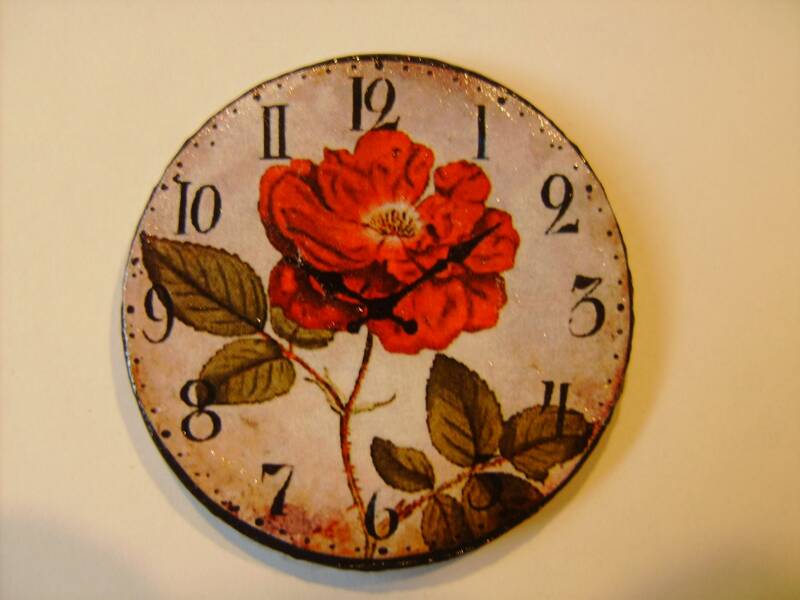 In Victorian homes & beyond, this floral clock takes on special meaning, as all flowers do. The Language of Love. You may pay with your credit card either directly through Etsy or through Paypal. I ship by 1st Class Mail/ Domestic & International. After you receive your purchase, if you are unhappy with your purchase, please contact me. Cancellations and returns are addressed on a case by case basis but need to be addressed within 14 days. Dollhouses cannot be returned. If a return is agreed upon, Customers will be responsible for the return shipping costs. In addition, there is a restocking fee. Many items are hand finished. Miniature RoseGarden has expanded into dollhouse kits, wallpapers etc . . . Basically Dollhouses & all the furnishings. I would like to have an opportunity to take care of any concern you may have. If there is an issue with a delivery, please let me know. I will track the shipment. I am happy to accept custom orders. Just send an email to me with your thoughts. We will work together to make your mini dreams come true.